Properties in Barbados average 4.7 out of 5 stars. Villa, New Private Pool / Deck / BBQ. Gardens. Easy Walk to Beaches, Retail. Property 4: Villa, New Private Pool / Deck / BBQ. Gardens. Easy Walk to Beaches, Retail. 'Suits Me Too!' Fantastic Location Across from the Sea! Property 5: 'Suits Me Too!' Fantastic Location Across from the Sea! Only 3 Mins To Beach And Beach Club apt 1. Property 9: Only 3 Mins To Beach And Beach Club apt 1. Property 25: Mistle Cove Apartment 101, Ground Floor Beach-front, private garden and pool. Property 29: Relaxing 3 Bedroom Home away from Home! 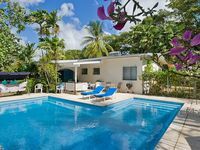 2 bedroom 1 bathroom unit on Barbados' south coast near to shopping & beaches. Property 31: 2 bedroom 1 bathroom unit on Barbados' south coast near to shopping & beaches. Very lovely place which we all enjoyed made some new friends in the neighbour hood, my family did not want to leave and we are thinking of returning soon, much unfinished buisness as I am now 64 years old and thinking of returning to live with my wife and kids. We had a great time at Lazy Days. The house is nice and well-equipped with everything you could need. The beautiful gardens and swimming pool are where he house really excels itself. My girls (5 and 2) loved just walking around the gardens with me - we saw monkeys, humming birds, lots of other birds and fireflies as well! It is only a 10 minute walk into central Holetown (sunset crest) where there&rsquo;s a huge Supermarket (Massy&rsquo;s) and there are lots of restaurants/bars/takeaways around if you don&rsquo;t want to cook. The kitchen is a great size and well-equipped. It could probably do with a new oven (hob works well but actual oven was pretty slow) but other than that it was perfect with every accessory you could think of and was well stocked with cutlery, crockery etc. Bedrooms are decent enough size and both have air con that works well. Both bathrooms are a good size as well and are nicely decorated (newer suites than in the photos). The house is very uniquely decorated and has a nice individual feel, with lots of shells and old corals and things around. We loved it here... it was so nice relaxing around the pool and it&rsquo;s a great location.